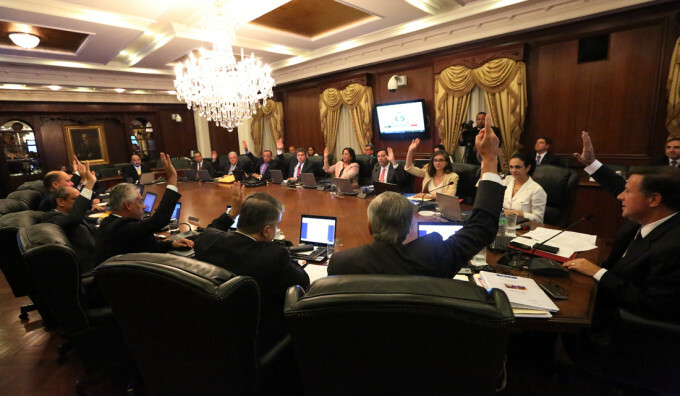 The Cabinet Council quickly approved the president’s high court nominees. The National Assembly might not, but it has been an unusual event when such appointments have run into significant opposition. Photo by the Presidencia. On December 10, after a screening and public input process that elicited a bit of public criticism, President Juan Carlos Varela chose Ángela Russo Maineri de Cedeño as a magistrate for the Supreme Court’s civil bench and Cecilio Antonio Cedalise Riquelme for a vacant seat in the court’s administrative chamber. Russo, tapped to replace Harley Mitchell, is an attorney in private practice who has served as a family court and civil appellate judge and teaches family law at the nation’s Catholic university, USMA. Mitchell’s term expires at the end of the year. Cedalise is a labor lawyer who advises the Ministry of Labor Development and teaches labor law at several universities. He was one of Panama’s negotiators for the US-Panama Trade Promotion Agreement. If approved he would replace Víctor Benavides, who was forced to resign while under criminal investigation by the legislature earlier this year. When Benavides resigned the National Assembly lost jurisdiction over his case to the regular prosecutors of the Public Ministry and those matters are still pending unresolved. The legislature’s Credentials Committee will begin hearings on the nominations in special sessions starting on December 14 and that process is expected to take about one week. Although there had been some criticism of the process by which the field of 164 applicants had been narrowed down to 10 finalists by a committee composed of Minister of Government Milton Henríquez, Minister of the Presidency Álvaro Alemán and presidential adviser Francisco Sierra, there was little initial criticism of the nominees themselves. Varela, however, does not control the legislature and the appointments could become embroiled in political power plays. However, both the PRD and Cambio Democratico parties, which might have reason to embarrass Varela, are themselves internally divided. The appointments leave several high court nominations outstanding. The president will have to appoint alternates — suplentes — for both of these nominees, plus replace magistrate José Ayú Prado’s late suplente Gabriel Fernández, who died on at his home of undisclosed causes on December 5. The seat vacated by the conviction on assorted corruption charges of Alejandro Moncada Luna is now occupied by his suplente Abel Zamorano. That post is on the court’s administrative bench. President Varela has yet to make a decision whether to promote Zamorano to occupy Moncada Luna’s post, replace Moncada Luna with somebody else and leave Zamorano as suplente or appoint both a new magistrate and his or her alternate. Varela insists that he does not interfere in judicial business and does not make any public show of doing so as his predecessor did. But both within the legal profession and among the general public there is a widespread belief that the executive branch does pull strings with the judiciary. It might be a matter of people having become so accustomed to corrupted and manipulated courts that they would not recognize judicial independence if they saw it. But just after he was elected in May of 2014 Varela called upon some magistrates to resign, two people have been forced off of the court and there is an unabated public clamor for accountability for public corruption, including in the courts.